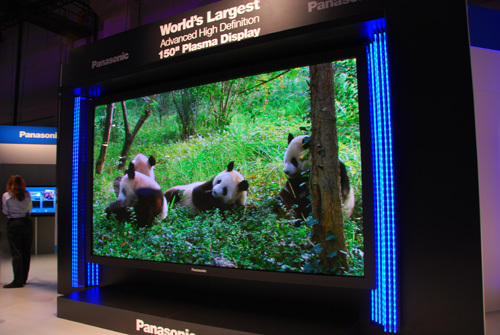 [CES 2008] Biggest TV Bragging Rights Go To Panasonic (Holy Cow) | OhGizmo! Want one? Rumor has it that you’ll be looking at something in the low six figs. I’ve seen one of these before. It was installed in the front of the Enterprise bridge. For the record (and for the rest of us geeks): According to the blueprints/technical manuals, the view screen of the original Enterprise is 6 by 3.5 feet (1.8 by 1.1 metres), diagonal 83 inches; that of the 1701-D is 4.8 by 2.5 metres (15.7 by 8.2 feet), diagonal 213 inches.